Springer Spaniels Rage – An Urban Myth? Is springer spaniels rage an urban myth, or does it really exist as a condition? Dog rage in general is also a term one hears. We do know that ‘mad dog’ harks back to rabies (which is usually fatal to humans), and we hear of ‘mad dogs’ in everyday speech, without any reference to rabies. Let’s be clear that we are not here associating dog rage or springer spaniels rage with rabies. Sudden aggression that happens without warning. Aggressive behaviour in the absence of other dogs. Changes to the eyes (temporary). This usually happens when there are no obvious external triggers (though there may be exceptions), and the episode stops suddenly. Springer spaniels appear to suffer no after effects, or ill-effects. Their behaviour reverts to normal after the event, which typically lasts a few minutes. The fact is that any biological organism is subject to disrupted behaviour, and higher mammals (which includes dogs), are included. The more complex the brain, then the more disorders it can be subject to. For the purposes of this discussion, springer spaniels brains (and dog brains in general) are broadly equivalent to ours, and any brain disorders to which we humans are subject are broadly presented in dogs – and therefore springer spaniels. On balance, expert opinion is that ‘rage syndrome’ in springer spaniels (and other dogs) is caused by an epileptic fit. It is quite rare – typically, only 4 in 10,000 dogs are subject to these fits. If you suspect that your springer may have this condition, keep the springer away from any children, then get expert advice. Diagnosis requires expert input, and there is evidence that springer spaniels are slightly more pre-disposed to this conditions than dogs in general, though suspect bloodlines are being terminated. In English springer spaniels, the condition is limited to the ‘show’ (US ‘bench’) bloodlines. It is not present in the field line of the breed. In Welsh springers, the incidence is no different to that in all dogs, but Cocker spaniels have a slightly higher incidence than average. Treatment for springer spaniels rage (and dog rage) is possible following accurate diagnosis. 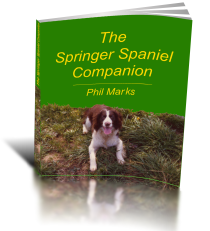 If you decide to take the dog to a springer spaniels rescue center, then be sure to tell them that you suspect the dog of having the condition, so that the staff are not endangered.